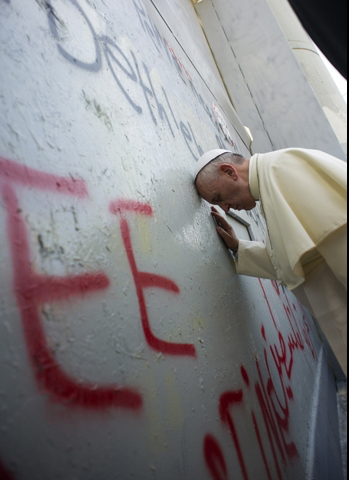 Pope Francis at the apartheid wall between Israel and the Palestinian territories. Pope Francis says that it is “violence” to build walls to keep out those seeking peace, and to widen the gulf between those who have so much they waste what’s extra and those who lack what they need. The Pope said this in a message dated Aug. 29 and directed to the International Meeting for Peace, organized each year by the Sant’Egidio Community. This year’s meeting was held in Tirana, Albania, and the Pope’s message recalled his own visit there. “In no other country of the world was the decision so strong to exclude God from the life of a people: just one religious sign was enough to be punished with prison if not death. This very sad primacy marked the Albanian people profoundly, until the moment of their rediscovered freedom, when the members of the different religious communities, tried by the common suffering endured, met again to live together in peace,” he said.